It is time to celebrate Invitational with yet another superb entry, this time an Inquisitor and his companions from Bigbossredskullz. My Merciless trio started with Peacock. I’m as anyone following my blog and batreps in particular a huge fan of walkers and I wanted to make an imperial version that had as much character as ork walkers have on default. The mannerisms that led to the name Peacock was a guiding factor when building it. I don’t know why that name stuck but it just worked. After Peacock I started on Mean-machine. I have a few of those really nice FW servitors but I wanted to do something more with it. Finding a half started project with terminator legs and ogre torso I took it from there. I wanted a being that show the horror of what it entails to become a servitor. Bionics and growth enhancements. I can hardly imagine someone would do it voluntarily..
Last but not least is Merciless himself, Inquisitor Jun Xing. He’s a rogue though still a loyal servant of the Inquisition. That he would look so similar to the classic Ming the Merciless is something that wasn’t intentional but that ended up defining this character in a way I’m most happy with. Villainous. I’ve already started expanding the warband with a series of xenos henchmen. So thanks to the Sleeters for making me take the INQ28 plunge – it’s a blast! Sporting the moniker The Merciless, the Ordo Xenos Inquisitor Jun Xing has built a reputation among the elite collectors of xenos baubles as the man to go too. Sporting outlandish clothing and weaponry reminiscent of eldar styling he looks the part as well..
We had to make some alterations when he was a child. Quote from Inquisitor Jun Xing. This is actually a very old build. 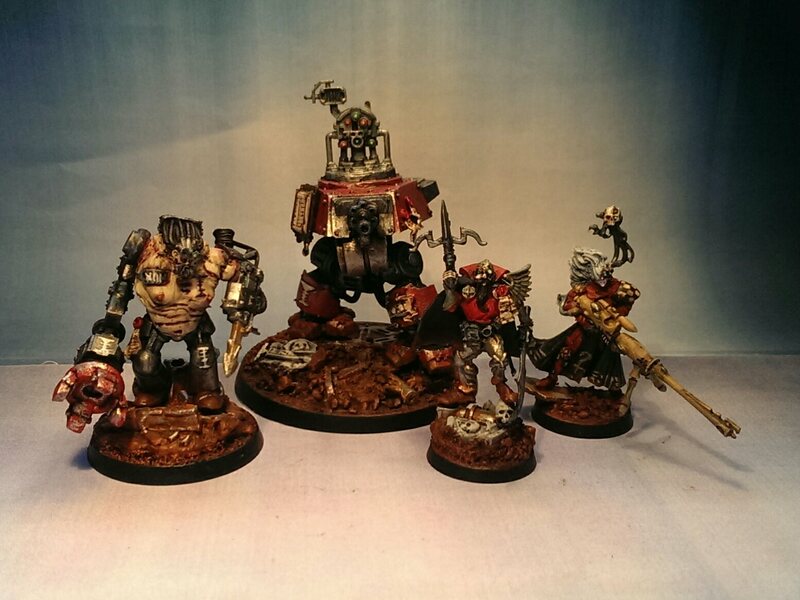 I once planned a scratch built admech army. This was one of three miniatures. The improvements this time is the combat arms, the head and the greenstuffing. Parts from plastic ogre, terminator, killa kan and dreadnought, FW servitor, sentinel. Yeah think that’s about it. Mean-machine is of course based on this fella. The machine spirit in gun servitor ZEQ586 is volatile for its kind and has a strangely strutting and proud bearing as if it wants to impress. So I gave it the name peacock, a mythical creature from ages past. – Quote from Inquisitor Jun Xing. This model was inspired by the gun servitor as seen here. I totally love Peacock. Such a fabulous character. Thank you 🙂 Peacock has obviously hit it off with a lot of people, which is really fun. Great work mate! So characterful and coherent as a group. Thanks Migs, appreciate it 🙂 stay tuned the next few days, I got a whole lineup of new henchmen on the go. Great work as always. You should do walkers more oftern. I really like the look of Wild Flower, and Jun Xing has a cool look, great beard. Cheers Jake, I really appreciate it 🙂 Ilieth the Wild flower was very fun to paint but took ages. She’s currently my personal favorite in the warband but I’ve got another female henchman in the pipeline I suspect will take her place. An excellent group of eccentric characters. The paint job is very sharp, with all the models nicely tied together with the stunning red. I think Peacock is my favorite; the model is so stout and indomitable, perfect for a gun servitor. Fantastic looking collection of characters; each one unique and memorable. Despite the vastly different builds and identities of the members of the Merciless’ crew, each one seems to fit perfectly. I think Wild Flower is my favorite. Her pose is so natural and powerful! Also the different contrasting visuals from her Eldar armor and weapons to her Imperial augmentations are superb. wow, what characterful models those are, love the Mean Machine, he really looks like someone you most certainly would NOT want to meet even on a sunny bright day! Cheers mate 🙂 Mean-machine was a fun build and I like the mix of brutality with the more docile face myself. The peacock and the wildflower are fantastic models. They’re so full of character and you really nailed the time honed red-bone-black paintscheme. I said it already over on your blog but what a cracking trio (or quartet now). I’m solidly in the Peacock camp. I only just noticed the =][= on Mean Machine – subtle touch mate. The tattoo was a first for me and something I’ll explore more in the future. 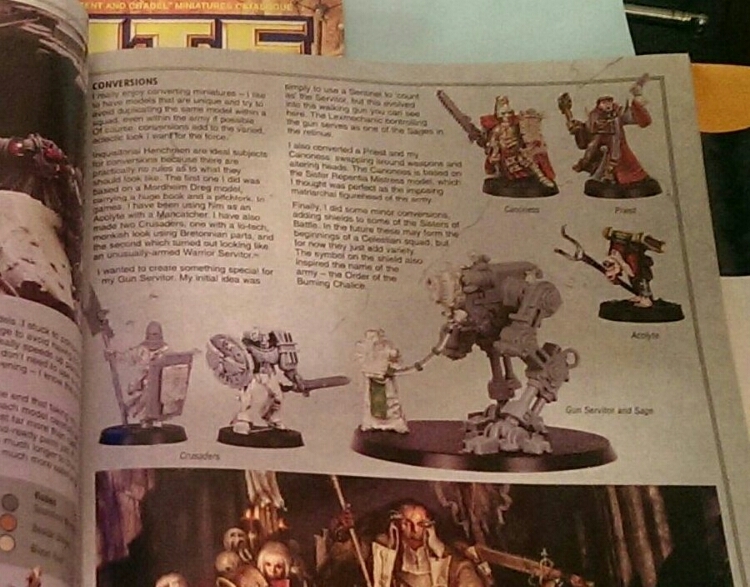 Excellent stuff and some wonderful conversions. Wild Flower looks ace!